Buck’s Upper Mill is located along the Waccamaw River in Bucksville, a small unincorporated community just outside of Conway. Both Bucksville and the neighboring town of Bucksport are named for Captain Henry Buck, a native of Maine who moved to South Carolina in 1820. 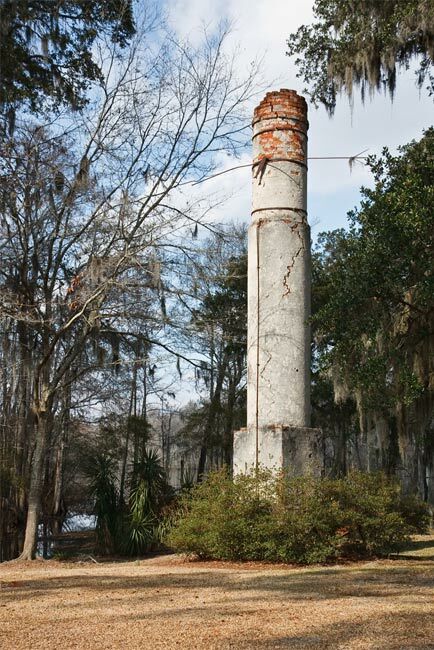 The brick chimney pictured above is all that remains of the first steam-powered lumber mill in the Southeast. Completed in 1828, Buck’s Upper Mill was the first of three sawmills built by Henry Buck. Buck’s lumber production grew steadily, and by 1838 he had established Buck’s Middle Mill. It was here that Buck constructed a small fleet of ships which helped carry his lumber to Georgetown and Charleston. A third mill, Buck’s Lower Mill, was completed in Bucksport a short time later and quickly became a center for commerce and trade in Horry County. Watch a video about Henry Buck and the Upper Mill Plantation. Many thanks to Joanna Thurman for sharing this picture and historical information.